I’ll readily admit I made a bold statement with the title of this article. The promise that I can help with anxiety & fear is no small claim. While I’m no psychologist or psychiatrist (nor do I play one on TV…ha ha) I do know a thing or two about fear, anxiety, and most importantly, how to get on the other side of letting it hold you back from living more fully in life. At one point in my life I dealt with some pretty extreme anxiety — I know what fear feels like, and while I realize it’s often brought on by irrational thinking, in the moment one is experiencing it it feels like anything but that. I talk a lot more about the specifics on my battle with fear & anxiety in my book, but our purpose here isn’t to discuss the nitty gritty details of what I went through. Rather, it is to dissect the practical things I did, and to some extent, still do in the hopes that you can formulate your own plan for overcoming something similar. While you may not experience fear or anxiety to the same level I did, or others do, the skills I hope to share will still be useful for you. 1. Acknowledge that there are varying levels of anxiety. In some instances you might be able to work through things yourself, and in other instances you may need the help of a medical professional to walk through your challenges. If that’s the case, don’t beat yourself up over it, accept the help, and play an active role in whatever plan is formulated to help you. 2. It can take time, but persistence pays off. If you’ve tried before, and things haven’t worked out, you’ve got to keep on and not give up. I know that can sound overly simple when you find yourself in the middle of the battle, but it’s absolutely true. I used to find strength in the stories of others who had experienced various kinds of challenges & obstacles, yet found a way to overcome them. There’s something very empowering about reading or hearing about how others succeeded in areas where we hope to accomplish something ourselves. Through the stories and examples found in others’ lives, I found solace in knowing that I wasn’t the only one who was experiencing what I was at the time, and because someone else had overcome something similar, then there was a real hope I could hang on to in knowing that I too could overcome what I was feeling at the time. Be intentional about seeking out and reading examples of others who found a way to work through life’s challenges. Then look at the lessons found in their stories and see how you can apply what you learned to help you get to where you want to go in yours. 3. 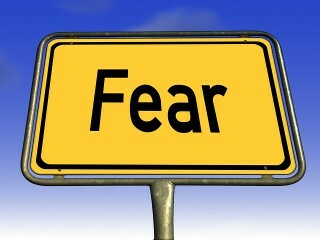 Fear stands for: F = false, E = evidence, A = appearing, R = real. When I first heard this I thought it was just some hokey, almost offensive little saying that was most certainly coined by someone who had never experienced the depths of real anxiety or fear. Turns out I couldn’t have been more wrong. It was data that proved to me that there was truth in the saying. I’ll share one such example from my own life. To give you some perspective, prior to my having experienced the particular bout with anxiety that I did, at the age of 15 I began doing telephone sales in our family business. In a nutshell that included calling prospective clients, qualifying them, setting the appointment, and then handing them over to one of our more seasoned (i.e. grown up :-)) sales team. I say that so it’s clear that prior to the anxiety I was performing the work with ease. Well, several years later, as I was making a routine call to a client, out of the blue I had what I now refer to as a blocking tic. You can think of it like a simple stutter, only it went terribly out of control. I couldn’t get my words out. I struggled and felt shear panic. I made it off the call, but something was different. And because I didn’t have many of the skills that I’m sharing in this article at my disposal to help work through the challenge, I struggled for years. I wasn’t stuck in in-action. I accomplished a lot of great things, but there was this challenge that followed me along my path. Now, here’s how the “fear is only false evidence appearing real” thing fits in. When I was walking through my anxiety, what I felt was as real as can be. But as I worked through it, and gained a different perspective, I’ve come to realize that if it were real, it would have been impossible for me to have been using the phone for business in the first place with ease. And certainly, I wouldn’t have been able to not only get back to the place where it was effortless again, but exceed that and eventually begin speaking to groups. The point here isn’t to belittle what you may be going through, far from it. The point I want you to grasp is that you can create a different future for yourself, in spite of whatever it is. 4. Take your focus off what you may experience in the future and connect with the present. I found that I would get warning signs when a bout of anxiety was going to rear its head. Previously, I would retreat from whatever it was that was making me feel uneasy. The problem with that is you think you’re helping the situation, but in actuality you’re feeding it by not working through it, which I’ve found only exacerbates it, and gives it greater strength the next time it shows up. Make no mistake, unless you’re working through it, there will be a next time. So, here’s the cool thing. Now, when I feel fear rushing up inside me, it tends to bring with it the idea that something in the future, even if it’s just a few moments in the future is going to escalate out of control. The thing is, that’s my mind telling me that. The real truth is, it may or it may not. Breathing techniques have been incredibly helpful for me to gain control of that limited time between anxiety and the calm to catch myself and be able stay in control. If you think it is too simple, please don’t discount it. It will do wonders for keeping you centered. And it’s that feeling of centeredness that will keep the fear from taking over. You can do a google search for “breathing techniques for anxiety” and you will find one that works for you. Here’s one of the combinations that I do. – Repeat the above steps 6 times. This isn’t a one time thing. I’ve done it for years. I still do it — it works. I’m not saying you only do this, but over time it makes a real difference. I’ve also found that it has the power to take you out of the state of fear, and bring you back to a more relaxed posture. The results can be pretty dramatic. It’s like a muscle, as you make it a regular part of your routine it will become more impactful. I would also recommend making mindfulness practice a regular part of your daily routine. Overtime this will help you get more present minded, which I’ve found is really helpful for reducing anxiousness. You can find a collection of good mindfulness audios, available to listen to free by searching for “free UCLA mindfulness” or you can go here to access them directly. 5. Employ workarounds, but be careful that they don’t become a crutch you inadvertently use to avoid facing what needs working through. Workarounds are a concept whereby you can end up accomplishing something in spite of whatever might be keeping you from it. For example, when I was experiencing times where it was a struggle to speak the words I wanted to say — much less express them in any semblance of an articulate way, I would employ a particular workaround that involved writing just as I would have spoken it. Over time my use of that workaround turned into an important skill that I still employ today. I love to write, and I have no doubt that I’m a much better writer for having employed the workaround I described. I have come to realize that at times, while it was useful and ultimately ended up making me a better writer — there were times I used it as a crutch, and likely kept myself in the cycle of anxiety longer than might otherwise have been the case if I’d had to face things head on quicker than I did. I bring this up not to downplay the importance of employing workarounds — absolutely do that, just be aware that you aren’t using them to keep yourself from facing something that, while incredibly uncomfortable, just on the other side likely holds growth in that area. 6. You have to embrace the idea that you can overcome the thing you fear. Everything shared here is going to be nearly impossible if you don’t hold on to the truth that what you are experiencing doesn’t have to be your reality forever. If there has ever been one person, in all of history, anywhere on the earth who has also overcome something similar, than you should embrace the fact that you can do so too. Have faith, hold onto hope, and stay in the game until you get to the place you want to be. 7. Take comfort in knowing that you aren’t alone in the battle you’re facing. I could easily have placed this as the first and most important item in the journey towards overcoming one’s fear and anxiety. Without a doubt, this above all the practical strategies I’ve shared has been most impactful in my being able to reach the other side of all of my life’s challenges. My relationship with the LORD is one where I know He is always walking with me, seeing me through, and even picking me up in the times where I didn’t think I could go any further on my own. I’ve always been a believer, I just used to think it was more about what I had to do in my own power. Now I realize God is as close as I am willing to let Him be in my life. When I’m feeling distant it’s likely because I am distant. I can change that in an instant — with a simple prayer, or reading his Word. I fully accept that you might completely disagree with this point — to which I am perfectly fine with — you’re a grown up, you can believe — or not believe as the case may be 🙂 whatever you like. That said, I wouldn’t be giving you my best authentic self if I didn’t share with you what I know to be the number one difference maker in my having been able to overcome anxiety and keep it at bay over the years. All the ideas I’ve shared here make a difference — I have just come to realize that it’s this one step that makes all the others come together. It’s an incredibly tough thing to look at life’s challenges and feel like your ability to reach the other side is wholly dependent on you. The other side of that coin is that it’s incredibly empowering to know that you have a heavenly Father that’s willing to be right there with you every step of the way if you’re only willing to ask Him to come into your life. As I mentioned before, I’ve experienced real fear and anxiety in my life. At times I’ve even allowed it to hold me back from fully living the life & purpose I was meant to be living. If you have found yourself in that place, be it past or present, don’t beat yourself up over it. You have a choice, you can stay stuck there, or you can apply the ideas above and begin that journey towards looking at it from the rearview mirror as you move forward on the more fulfilling journey that awaits you. Always remember that you are meant for greatness — it’s a part of your very DNA. That doesn’t mean that life is always going to go smooth, nor that you won’t experience new challenges along the way — in spite of that, never forget that it’s your life, so you may as well live it to the fullest. Always remember to make the most of today, because it becomes your tomorrow, and your tomorrow, because it becomes your life! P.S. 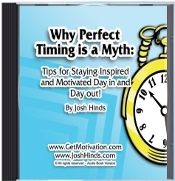 Check out my book titled, It’s Your Life, LIVE BIG! It’s a personal leadership book that will teach you the skills necessary to live a more purpose filled life so you can experience a richer & more rewarding life’s journey.